Iowa State coach Paul Rhoads has not decided if he will continue to rotate quarterbacks Grant Rohach and Sam Richardson in this week’s game at Oklahoma. Rohach got his first start on Saturday in a 21-17 loss to TCU. Rhoads says Rohach will start against Oklahoma because he is more capable of throwing the ball right now. He says Rohach gets the start even though he was “not very good” against TCU. “He missed too many passes, he made too many poor decisions. He’s the first to recognize that,” Rhoads says. 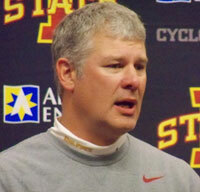 Rhoads says Richardson continues to battle and injured ankle and he also has an injured thumb on his throwing hand. He says they planned to use Richardson in running situations and his thumb was good enough to throw, just not 100 percent. Asked what the fans should take out of the season Rhoads says that despite a 1-8 record the future of the program is brighter. “I think the fans recognize we entered the season with a very youthful and inexperienced football team that was quickly decimated by injuries at offensive line, and severely affected at the quarterback position with injuries, and thus we’re going to struggle because of it,” Rhoads says. With three games remaining on the season Rhoads wants the Cyclones to continue to focus on improvement and he says he is always looking to improve whether they are 9-0 ore 1-8 and he wants them to play with the same emotion that they played with Saturday. Rhoads says a season like this always leaves coaches searching longer and harder for answers in different ways. He says there are a lot of things they look at to try and figure out what has gone wrong.